Pat Doyle died Dec. 30 after a battle with cancer. He was 47 years old. Fort Oglethorpe Police Chief Mike Helton, addressing the council on Jan. 14, discusses the death of friend and colleague Pat Doyle. Fort Oglethorpe officials recently renewed a working agreement between its police department and the Lookout Mountain Drug Task Force and afterwards took time to remember Cmdr. Pat Doyle, who died a couple of weeks earlier. "The city has adjoined with the Lookout Mountain Drug Task Force and the other agencies within the judicial circuit for a number of years now," Helton said. "We've had an officer attached to the task force for years. There's no additional cost to us at all and there's nothing budget-wise." Although the agreement will keep up the PD's working relationship with the Lookout Mountain Drug Task Force, Helton and the council made it a point to recognize Doyle's contributions to the task force and the community as both an officer of the law and a family man. "He was pretty well known and very respected in this community," Mayor Earl Gray said. Doyle died Dec. 30 after a battle with cancer. He was 47 years old. Chief Helton, who knew Doyle a long time, explained how he was a great lawman and a proud father. "He will be seriously missed," Helton said. "He was a great leader for that task force. He'd been serving there a number of years. We just posted in the police department today that his family has established a college fund for his son. That was his pride and joy, was his son." Helton said Doyle loved being a doting father and took a lot of pride in protecting the community. "He spent a lot of time hunting and bonding with his son. I think that was his only child, who meant the world to him," Helton said. Helton said no matter the circumstances, Doyle always gave everything he had to those around him. "We want to thank him for his service and his family for his sacrifice. He put in a lot of hours," Helton said. "Whenever the call came in — and usually that's after dark and after 5 o'clock ... they would always respond any time they were needed. He was just a great man." Fort Oglethorpe Mayor Earl Gray discusses elections. The city of Fort Oglethorpe has reached an agreement with Catoosa County to oversee its municipal elections that'll take place later this year. During the Jan. 14 City Council meeting, officials unanimously approved a new contract in the amount of $13,403 that puts the Catoosa County Board of Elections in charge of running the whole show. "It's an intergovernmental agreement with the Catoosa County Board of Elections and Registration to conduct elections on behalf of the city of Fort Oglethorpe," said Fort Oglethorpe City Manager Jennifer Payne-Simpkins. "We had an existing agreement similar to this, but this new agreement actually expands the duties at no additional cost to the city." Unlike in years past, prospective candidates will now qualify at the Catoosa County Elections Office instead of Fort Oglethorpe City Hall. "The Catoosa County Board of Elections and Registration will actually do everything for candidate qualification," Payne-Simpkins said. "They will also handle everything — the building and printing ballots, tallying ballots, on-site technical support during advanced voting, on-site election day technical support, and certification of final election results." According to City Clerk Carol Murray, Fort Oglethorpe will have Mayor Earl Gray's term expiring this year, as well as the terms of City Council members Rhonda James and Derek Rogers. The mayoral candidate qualifying fee will be $315, while those seeking to run for council will have to pay a fee of $255. Both fees represent 3 percent of each office's annual total gross salary. Mayor Earl Gray said that letting the county handle everything for the elections makes a lot of sense since the county has done a lot of the work in recent years anyway. "Ms. Simpkins and myself spent quite a bit of time with them and this is pretty much like the old one," Mayor Gray said. "It does get it to where it doesn't have to be renewed every year. It also has a section in it where the contract can be voided at any time by either party. I think it's a good solution and it's also going to put everything at the county where last year we were doing some of it here and some of it at the county. I think it's a good deal for the city." Also, qualifying dates for the three seats will last for a week this year rather than the usual three days. Qualifying will open Monday morning, Aug. 19, at 8:30 a.m. and run through Friday, Aug. 23, at 4:30 p.m. Candidate hopefuls can fill out their qualifying paperwork and pay fees at Catoosa County's Freedom Center (Ringgold precinct) on Evitt Street behind the historic Depot. In addition to the elections agreement, the board also unanimously appointed Councilman Jim Childs to serve as mayor pro tem for 2019. Home and community-based services help people — especially the elderly —- remain in their homes instead of moving to nursing homes or other institutions. Raghubir Singh and her husband love their rural home, and they want to stay there. Raghubir is 75, has serious shoulder problems and had surgery recently. And that's not the worst of it. "My husband is a pretty sick man,'' she says. Surinder Singh, 82, has heart, lung and kidney conditions, as well as diabetes. He was recently hospitalized for nine days, she adds. "How can I take care of him?'' she asks. "I need some help now." Potential good news for those on the waiting list came recently. Gov. Brian Kemp unveiled a budget proposal for fiscal 2020 that includes an extra $1.8 million for these home and community-based services, which help people remain in their homes instead of moving to nursing homes or other institutions. "We are so grateful to the governor for his insight and budget recommendation," Vicki Johnson, chair of the Georgia Council on Aging, said Thursday, Jan. 17, in a statement after Kemp's budget was released. "Not only is this the most cost-efficient way of helping our elderly citizens, but it also allows them to stay in their homes where they prefer to be." In fiscal 2017, about 34,000 Georgians received these services, a 9.9 percent increase from the previous year. Seniors in all 159 of Georgia's counties are on the waiting list. The counties with the most are DeKalb, Gwinnett, Fulton, Clayton, Bibb and Chatham. "It's far less expensive than the alternatives, and it's giving our seniors and their families an option they want and need," she said. A person may be selected from the waiting list to receive services based on the severity of need, the availability of family support, the length of time on the waiting list, and an individual's continued eligibility for the level of care provided in a nursing home, according to state documents. The budget plan also includes $338,802 for Georgia's Aging and Disability Resource Connection. These community centers provide information and referral services to older Georgians about private and public help that's available. More than 95,000 Georgians received assistance through community centers in fiscal 2017 from more than 26,000 communitybased providers, said the Council on Aging. During the Jan. 18 swearing-in ceremony, Tonya Craft was able to share the special moment with her husband David. During the 22-day trial in 2010, Tonya Craft spent a lot of time at the Catoosa County Courthouse defending her innocence. 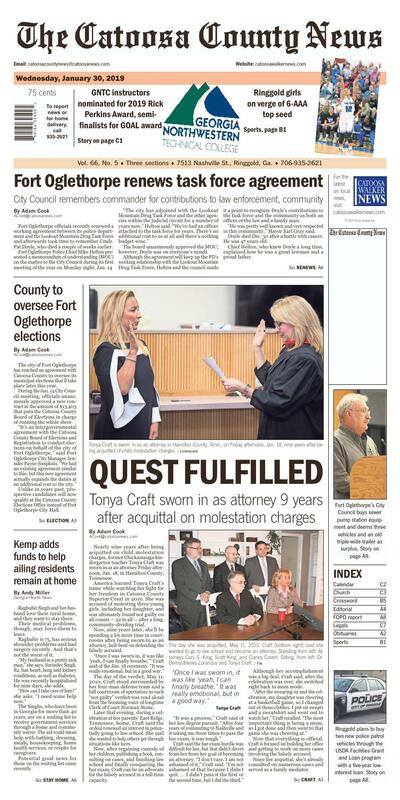 Nearly nine years after being acquitted on child molestation charges, former Chickamauga kindergarten teacher Tonya Craft was sworn in as an attorney Friday afternoon, Jan. 18, in Hamilton County, Tennessee. "Once I was sworn in, it was like 'yeah, I can finally breathe,'" Craft said of the Jan. 18 ceremony. "It was really emotional, but in a good way." The day of the verdict, May 11, 2010, Craft stood surrounded by her four-man defense team and a full courtroom of spectators as each "not guilty" verdict was read aloud from the booming voice of longtime Clerk of Court Norman Stone. Later that evening, during a celebration at her parents' East Ridge, Tennessee, home, Craft said the ordeal renewed an interest in potentially going to law school. She said she wanted to help others get through situations like hers. Craft said the bar exam hurdle was difficult for her, but that didn't divert from her from her goal of becoming an attorney. "I don't care. I am not ashamed of it," Craft said. "I'm not ashamed of that because I didn't quit. ... I didn't pass it the first or the second time, but I did the third." "I've already been mediating," Craft said. "I've been mediating for about four years now and I've been consulting for about seven. My office is Tonya Craft Legal, so I'm going to do mediation, consultation, and litigation." Lately, Craft said, she's worked on cases in Hawaii, New Jersey, Florida, Alabama and Georgia. "The kids were there. They've been there through the whole thing and they're real excited and proud," Craft said. "They were really sad for me when I didn't pass the bar the first time. ... That was the first test I've ever failed in my life. I cried for two days. It's only offered twice a year. So essentially, I studied for a year and a half for that thing. I was so over it. It was great having them there with me when I finally got sworn in." "Everything that's happened and the opportunities that I have, the blessings that are happening, I appreciate greatly," Craft said. "But I didn't ask for it and I didn't want it. I would love to be teaching kindergarten and for nobody to have heard of Tonya Craft except little kindergartners. I would love that, but that's not the case."